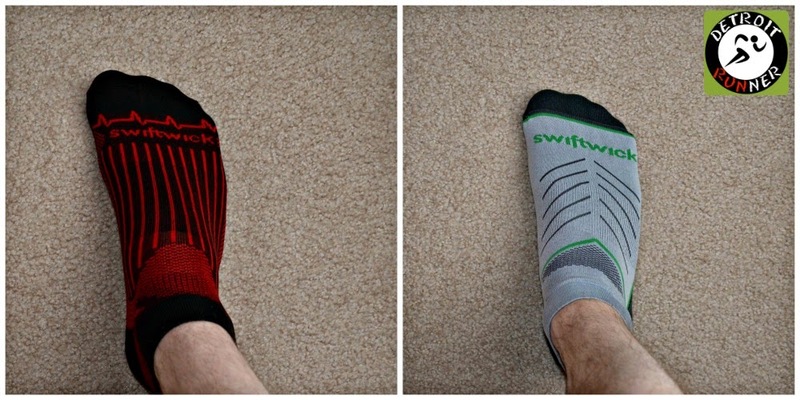 A couple weeks ago I received a couple pairs of Swiftwick socks for review. I received their Pulse and their Vibe socks. For a little background, I've actually worn Swiftwick for a couple years now. I also have some other brands that I wear as well but I keep coming back to Swiftwick. All the Swiftwick socks I've worn have a great compression feeling to them. For me, I like that feeling while running. The socks stay in place which is imperative for long distances. I also prefer the length of their "one" length which is just high enough to be above the shoe tongue. I've also worn the "zero" length which is basically their "no show" length and while they feel similar to the other length, I like the protection of the "one" length better. I could not agree more with this. As I said, the compression feeling is a great feeling when running and they make your feet so comfy. They are blister free. I've run as long as a marathon in them and I've yet to get one blister in them - ever! Of course, the moisture wicking features are likely one of the reasons for no blisters. The socks are made with Olefin - a fiber that retains less than 0.01% of its weight in moisture and resists deterioration from perspiration and detergents. Because of this fiber and the excellent construction, the socks last. I still have my original pair I won over two years ago. That's right, I won them in a blog contest and I've been wearing them since and all pairs I own are still as good as new. The fit on the socks molds to your foot and the seamless toe help keep them comfortable no matter how many times you wear them or wash them. In regards to the Pulse, they are the thinnest socks I've run in. I really enjoy these and it seems the thinner socks are, the more I like running in them. 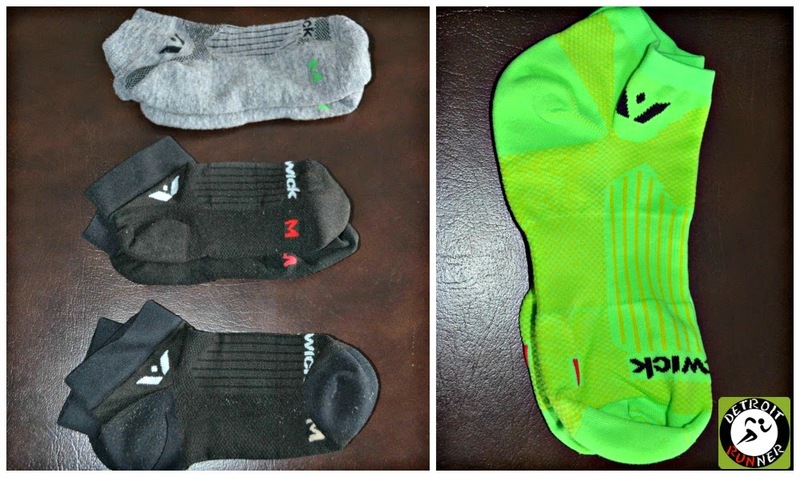 I don't prefer a thick sock, not that any of the Swiftwick socks are thick. I've run up to a half marathon in these and love them. These also have silver ion built into them to help with odor and fungal control. The Vibe are the thickest of the Swiftwick socks but, as I said, they are still not really thick. I've run up to 14 miles in these with no issues as well. They also come with a little color which is nice, but not really a big deal to me. Most of the other socks I've purchased are black which work well for doing trail races. I also own several of their other lines including the Pursuit, Aspire and Sustain. The Pursuit are their Merino wool option and, while you can wear these all year, I typically reserve these for colder weather. They seem to work well for me from 20-30 degrees. Much lower temperature than this and I still get cold feet with them unless I run with my Goretex shoes. The Aspire socks have really been my "go-to" socks for racing. I've had the most success with these and the fit is perfect for my feet. I own numerous pairs of these. While the company says they are a good fit for narrow feet, I've never felt that my feet were that narrow. I also have them in "zero" length and in green(shown below). They work well too but I just like them a bit higher on me. Swiftwick now offers these in several colors too. The Sustain style is also a favorite of mine and they are the socks I won and was introduced to Swiftwick a few years back. I just wore them the other day and also added a black pair as well. These are made from post-industrial recycled nylon and, if you are earth-conscious like I am, these are a nice complement to your running wardrobe. If you have not tried out a pair, check them out at your local running store(I know RUNdetroit sells them since I've bought some there) or online. 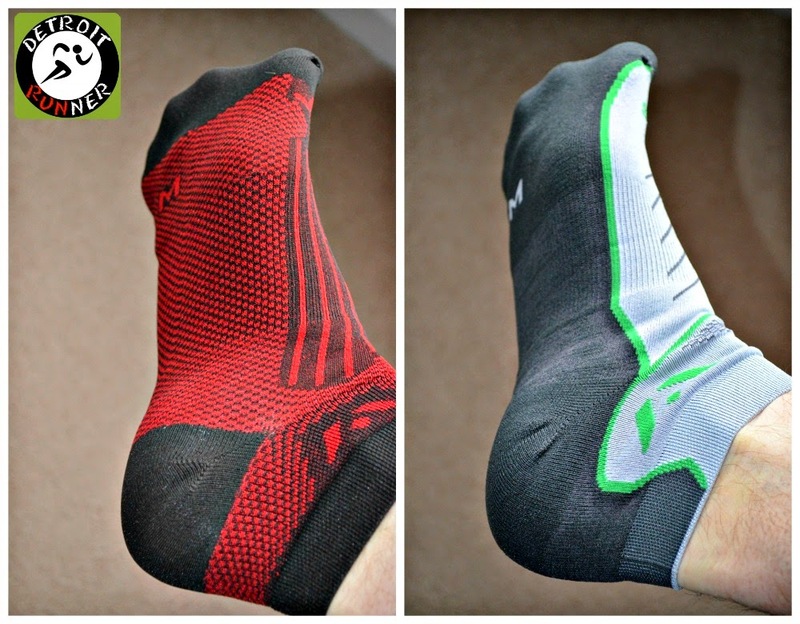 The socks I've reviewed here are $13.99 to $16.99 and while I never thought I'd say it, for socks at this price, they are worth ever penny to protect your feet. They are even made in the USA! Disclosure: I received two pair of complimentary Swiftwick socks for this review. All others were my purchases. All opinions are my own and I was not required to give a particular opinion other than an honest one.